Derwin Pereira: The international opprobrium heaped on Myanmar leader Aung San Suu Kyi, for her inactivity on the Rohingya crisis front, obscures an uncomfortable truth. It is that her country is facing an insurrection, which it has the right to counter. She is finding it difficult to make her case to an international audience because of the excesses committed by Myanmar's military, a habitual throwback to the era when she herself was a prisoner of the junta. She is being castigated for not according to the Rohingya, a stateless Muslim minority that has long complained of persecution in mainly Buddhist Myanmar, the benefits of the democratic freedoms that she did so much to bring about. In an indication of Ms Suu Kyi's fall from international grace, Oxford City Council has stripped her of a human rights award, and her Oxford college has removed her portrait from public display. She has been rejected by a city and an institution which had identified their liberal rationale with her fight for freedom and democracy in Myanmar. Her credentials as a Nobel Peace laureate are under pressure. Many of those who had turned her into a symbol of defiant freedom are aghast at her apparent reincarnation in power as the face of the heavy-handed Myanmar state. What is being glossed over is that her nascent power is being threatened, not by the military that seeks to co-opt her international persona to build a new Myanmar, but by militants who have inserted themselves into Myanmar's transition from autocracy to democracy. The militants go by the name of the Arakan Rohingya Salvation Army (Arsa). It was they who began the latest round of hostilities in Rakhine state by attacking police posts in late August and provoking the military response that has sent more than half a million Rohingya fleeing to Bangladesh. Arsa had attacked the border police last October, killing a number of them and seizing weapons. The August attacks were, arguably, a carefully calibrated attempt to escalate tensions and invite precisely the kind of military response that would create a humanitarian crisis and place the Rohingya issue in the international spotlight. If that was its intention, Arsa has succeeded, but it has also drawn scrutiny of its own origins and objectives. Initially called the Harakah al-Yaqin (the Faith Movement), it is said to have been set up in 2012 in the wake of anti-Muslim riots in Rakhine. Its commander is Ata Ullah, believed to have been born into a Rohingya family in Karachi and to have lived in Saudi Arabia. According to one report, the militants owe allegiance to a committee of rich Rohingya emigres resident in Saudi Arabia. But Arsa leaders in Myanmar have denied such links. Myanmar sees Arsa as a terrorist organisation with links to militants trained by the Pakistani Taleban. These transnational links become ominous when seen against a regional backdrop where terrorists have been able to capture and hold territory for months in Marawi, the Mindanao city in the Philippines' restive south. Their dramatic display of military and organisational power has alarmed governments, including Australia's. Prime Minister Malcolm Turnbull has warned that Marawi must not become South-east Asia's Raqqa, the Syrian city that is the quasi-capital of the Islamic State in Iraq and Syria (ISIS). Although no connections have been established between Arsa and ISIS, it is a well-known fact that that global terrorist organisation has firm plans to make South-east Asia the second base of its caliphate. In fact, the return of South-east Asian fighters from the Middle East, in the face of sustained attacks on ISIS in its home territory, is a part of the logic of creating a second front that can continue the militant struggle. Myanmar, which says that Arsa wishes to create an Islamic republic in northern Rakhine, has the right to stop not only a potential secessionist movement but also one that would extend the reach of global militancy in South-east Asia. An associated fact is that not only Muslims are paying the price of conflict in Rakhine: The communal violence displaced 27,000 ethnic Rakhine Buddhists as well. Attacks on non-Muslims have fuelled the crisis, turning swathes of Buddhist public opinion against the community from which the Arsa insurgents are drawn. None of this diminishes the brutality and high-handedness with which the Myanmar military and police reacted to the Arsa provocation of August. 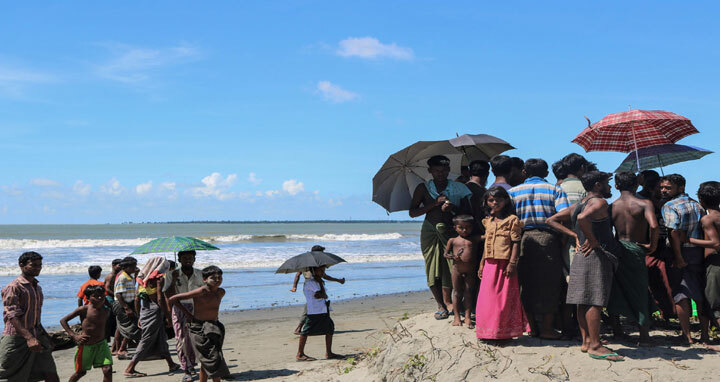 The attacks on Rohingya civilians border on, if they have not already crossed, the line of ethnic cleansing, an abhorrent practice that has no place in the affairs of any country. What the Myanmar authorities need to realise is that the majority of Rohingya have not been associated with militancy, let alone terrorism, in spite of the official discrimination they say they have long faced. What is occurring now is a self-evident attempt by a particular militant group to give a political issue a religious complexion and make it part of a global militant agenda that justifies the use of violence against those who avowedly persecute Muslims. More than Arsa, whose military capabilities are limited, the source of the crisis is the festering legal and economic problems of the Rohingya. Dismissing them as Bengalis squatting on Myanmar soil, as the Myanmar authorities are wont to do, will not resolve anything. The Rohingya have been inhabitants of Rakhine for generations and cannot be wished away. As the crisis quietens down, the return of Rohingya refugees from Bangladesh must be accompanied by attempts to redress their grievances within Myanmar's constitutional framework. Whether this can lead to their recognition as citizens is a major issue that cannot be resolved at one go. However, the least that can be done is to ensure their physical and economic security on Myanmar soil. It is in this way that Arsa will lose the support that it enjoys among the Rohingya. The crisis in Rakhine is not a religious one. It is a political one which requires a political solution. The writer heads Pereira International, a Singapore-based political consultancy. He is also a member of Harvard University's Belfer Centre for Science and International Affairs.